I didn’t know what they actually feel like until that morning. The first thing I tried to do was, if I remembered correctly, getting out of futon looking for my socks. OK, let’s move. Move….why can’t I move my legs? There was something heavy on my legs. I don’t remember if I actually saw it (then where did the light come from?) or just felt it by hands, but anyway, I found that it was my small bookshelf. When I lived in that apartment, I didn’t have a bed because there was absolutely no space for that in my small room. I would lay out my futon every night, with the headside being close to the bookshelf for my bedtime reading. Once in a while, when I felt like it, I put the pillow on the opposite side just for a change. For some reason, I felt like changing sides the night before, and I was glad that I did. Otherwise it would have been my head that was hit by the bookshelf. I moved the bookshelf to free my legs and put on my socks that were found in my futon. Should I stay inside or get out of the apartment? WHICH IS SAFER? INSIDE OR OUTSIDE? Seemed like the apartment didn’t collapse, at least, but I had no idea how much damage it got. What are other people in this apartment doing now? Now I don’t remember exactly which I did first, opening the window to see outside, or getting out of the room to see someone in the same apartment. And at some point, I did turn the gas off at the main, but don’t remember when. When I tried to open the door chain lock to get outside my room, I found something was wrong…I couldn’t open it. What’s wrong? I tried and tried, but it didn’t work. After trying more than 10 times, I knew it wasn’t the lock…it was me. Somehow my fingers didn’t work. I just couldn’t slide the chain thing to the proper position to unhook it. C’mon, hurry!! What if an aftershock occurs right now!? This apartment won’t survive another quake! I won’t be able to get out and die right here!! I felt as if my heart came up to my throat and started pounding there. It was a feeling that I’ve never ever felt before in my life, PANIC. For several years after that, I had to deal with the flashback of that panicky moment everytime I tried to open a door chain lock. Somehow I managed to open the door and went to my next-door neighbor’s. I knocked on the door, but no answer. Then I went upstairs. (My apartment was a 3-storied building with 6 rooms and my room was on the 2nd floor.) I HAD TO see someone. The power must have been down at that time, but I clearly remember that the emergency night-light above the stairway was on. A young woman came out a moment after I knocked on her door. I asked her if she was alright, and she seemed to be puzzled why I was there. She said she was alright, no serious damage in her room, and she didn’t look interested in evacuating at all. Quickly she went back inside after saying to me, “Thanks for coming to check on me.” I was still confused, but my fear was lessened a bit. I went back to my futon again and sat on the mattress, wearing a heavy jacket and with my legs covered by futon, trying to warm up. So, at least, no one is evacuating from this apartment right now… But does that mean I don’t need to? As it got lighter outside, an unbelievable scene came into my sight. The rice shop across the street from my apartment was a two-storied house and they ran the rice shop downstairs. But all I saw then was the roof and the upstairs part of the house. Underneath them were the wreckage of the house and a white car, completely crushed!! Also I began to see the details of what happened in my room. 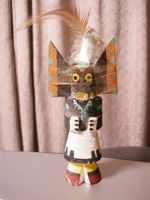 The books from the bookshelf that fell on me were scattered around, and among the books, I found a kachina doll. It was a souvenir I got from the landlady when I was in Phoenix, AZ. She gave it to me so that I could have a safe flight back to Japan. She said the doll would break and save my life when something terrible happens to me. But it was several hours later that I recalled what she said to me about the doll. I just picked up the kachina doll and noticed it was partly broken, then I put it back on the floor again... not knowing what to do with it. Looking back on those happenings now, 95% of me sees the whole thing as just a coincidence. The rest of me (5%) thinks that maybe the Kachina doll had something to do with my luck. But at that time, I was too confused and forgot about the Kachina right away. Obachan, glad you were okay. Read this useful article. I found this article an eye-opener. Sent to me by a friend in January, it was written by an American researcher (Professor) who had studied earthquake in several countries for many years and experienced them himself, and was supported by another researcher in Japan. (Sorry, I didn't have the names with me as I keep the full articles at my office in Kuala Lumpur). It tells of how there would have been zero percent survival for those using duck-and-cover method and how there would likely have been 100 percent survivability for people using the "triangle of life" method. Simply stated, when buildings collapse, the weight of the ceilings falling upon the objects or furniture inside crushes these objects, leaving a space or void next to them. This space is called the "triangle of life". The larger the object, the stronger, the less it will compact. The less the object compacts, the larger the void, the greater the probability that the person who is using this void for safety will not be injured. 1. Everyone who simply "ducks and covers" WHEN BUILDINGS COLLAPSE is crushed to death - every time, without exception. People who get under objects, like desks or cars, are always crushed. 2. Cats, dogs and babies all naturally often curl up in the fetal position. You should too in an earthquake. It is a natural safety or survival instinct. You can survive in a smaller void. Get next to an object, next to a sofa, next to a large bulky object that will compress slightly but leave a void next to it. 3. Wooden buildings are the safest type of construction to be in during an earthquake. The reason is simple: The wood is flexible and moves with the force of the earthquake. If the wooden building does collapse, large survival voids are created. Also, the wooden building has less concentrated, crushing weight. Brick buildings will break into individual bricks. Bricks will cause many injuries, but less squashed bodies than concrete slabs. 4. If you are in bed during the night and an earthquake occurs, simply roll off the bed. A safe void will exist around the bed. Hotels can achieve a much greater survival rate in earthquakes, simply by posting a sign on the back of the door of every room, telling occupants to lie down on the floor, next to the bottom of the bed during an earthquake. 5. If an earthquake happens while you are watching television and you cannot easily escape by getting out the door or window, then lie down and curl up in the fetal position next to a sofa, or large chair. 6. Everybody who gets under a doorway when buildings collapse is killed. How? If you stand under a doorway and the door jam falls forward or backward, you will be crushed by the ceiling above. If the door jam falls sideways you will be cut in half by the doorway. In either case, you will be killed! 7. Never go to the stairs. The stairs have a different "moment of frequency". (They swing separately from the main part of the building). The stairs and remainder of the building continuously bump into each other until structural failure of the stairs takes place. The people who get on stairs before they fail are chopped up by the stair treads. They are horribly mutilated. Even if the building doesn't collapse, stay away from the stairs. The stairs are a likely part of the building to be damaged. Even if the stairs are not collapsed by the earthquake, they may collapse later when overloaded by screaming, fleeing people. They should always be checked for safety, even when the rest of the building is not damaged. 8. Get near the outer walls of buildings or outside of them if possible - It is much better to be near the outside of the building rather than the interior. The farther inside you are from the outside perimeter of the building, the greater the probability that your escape route will be blocked. 9. People inside of their vehicles are crushed when the road above falls in an earthquake and crushes their vehicles; which is exactly what happened with the slabs between the decks of the Nimitz Freeway. The victims of the San Francisco earthquake all stayed inside of their vehicles. They were all killed. They could have easily survived by getting out and sitting or lying next to their vehicles. Everyone killed would have survived if they had been able to get out of their cars and sit or lie next to them. All the crushed cars had voids 3 feet high next to them, except for the cars that had columns fall directly across them. 10. As paper does not compact, newspaper offices and other offices with a lot of paper would have large voids surrounding stacks of paper.